Or so the saying goes. Actually, we've had plenty of both. which meant hooking up one of our smaller totes at the top of the garden to catch overflow. 275-gallon water tote for overflow. And in the flowers department? although the wild roses seem about done. First flowers on my rugosa rose bushes. White clover has been blooming for the past couple of weeks. creating a lovely volunteer ground cover & therefore welcome. Catsear, also known as false dandelion (dandelions are blooming too). top of the garden, probably planted as a landscape plant. Besides all the rain, I was relieved that it hasn't been as hot as April 2016. Last year we had mid- to upper-80s F (upper-20s C) for most of the month. Then May upped the ante by kicking into the upper-90s F (mid-30s C) and it stayed that way for the rest of the summer! Not that we have a choice, but I am so hoping that a cooler April means a more tolerable summer this year. Last month I did a poll to see if anyone would be interested in this and got over a 90% positive result, so I went ahead and scheduled it. It will be by Sun Ovens International, which is the company that makes my solar oven. I'm really happy with mine and so agreed to host it. You don't need a Sun Oven to take advantage of the class, and I'm guessing there will be a discount code for those who would like to buy one. I've never hosted a webinar before so this is new for me. This bundle is being organized by the same folks who do the Back To Basics Living Bundle. I've participated in the B2B bundle for the past two years because I think it is an excellent resource for folks trying to uncomplicate their lives, as well as a great opportunity for authors. 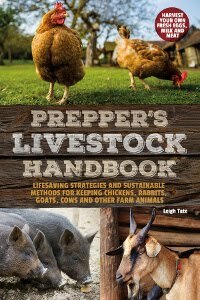 I have to confess that participating in two such events is a lot for me, but also that the prepper bundle is really more appealing to me personally because of my lifestyle. My contribution will be the eBook version of my How To Bake Without Baking Powder. Anyway, I thought I'd give you a heads-up on those two things. I'll pass on the details as I get them. It may look like a paper bag, but it's not. There is an idea floating around the internet for a deterrent for carpenter bees and wasps. Take a small brown paper bag, fill it with plastic bags or newspaper, and hang it in the area where carpenter bees or wasps are a problem. We have a terrible carpenter bee problem and have tried various recommended deterrents, so far without success. Since some people say the paper bag works for them, I decided to give it a try. ... all over Sam's kitty bed (and all over Sam). After Dan hung it up the carpenter bees showed up as usual and it did indeed stop them in their tracks. A number of them spent the rest of the day hovering a safe distance from the bag, watching it. They would zoom away and back again, always to halt short of that bag and stare at it. We were cautiously optimistic that perhaps we had found a solution to the problem. The only reservation in declaring it a success was in not knowing how smart carpenter bees actually are. By about the third day they figured out that no hornets were forthcoming, so they proceeded to ignore it and resume their annoying burrowing in our porch roof rafters. Wasps, ditto. We removed two wasp nests in the same time period, but maybe the wasps weren't smart enough to notice. silicone window caulking, but they cleaned it out again. If paper bag method has worked for you, then I'm not going to brag that our carpenter bees are smarter than yours, I'm just going to wish it worked for us too. above, you can see that they are not respecters of paint. I also read that they don't like citrus and found some directions for a DIY citrus spray. Next time I go shopping I'll get some oranges or grapefruit and make some. I'll let you know how it works. This is Sky. She's a mountain goat wannabe. of wall from the old goat shed. Sky loves climbing on it. And jumping off it (while Jack observes). Her sister Windy like it too. I haven't done one of these posts in quite awhile. I did several of them a few years back, when I was working on chapter eight for 5 Acres & A Dream The Book, "Energy Self-Sufficiency." We had been working hard to decrease our energy usage from the previous years and were successful. 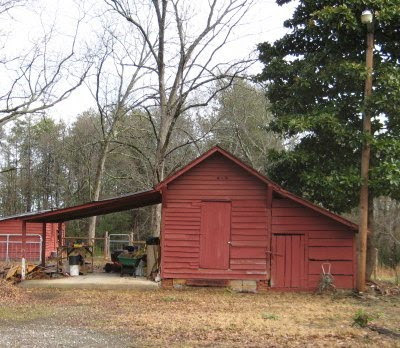 We've remained diligent and conscientious in our electric usage, and have looked for alternate ways to add things like solar lighting for the barn, and a solar attic fan. 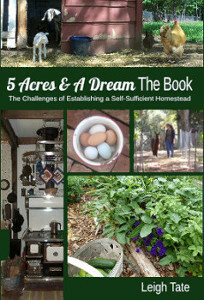 I am revisiting this because I am working on a sequel of sorts to 5 Acres & A Dream The Book, and I felt an update was appropriate. I want to preface it by stating that I only address electricity because we have an all-electric house. We have electric heat, an electric stove, an electric water heater, and an electric clothes dryer: no natural gas, propane, or home heating oil. If you use any fossil fuels and are interested in comparing your total energy usage to ours, head on over to this calculator to convert your therms into kWh, and then add it to your electric usage for a more accurate comparison. Looking back over this past year's electric bills, our average kWh usage has been 16.9 kWh/day. The monthly range for that was 13.41 to 20.53 per day. Total monthly usage ranged from 428 to 616 kWh, but our billing cycles vary between 29 and 32 days, so monthly figures are less useful than averages. Our monthly average for the past year was 510 kWh per month. How did we manage to get our usage down? Instead of the heat pump we use an EPA certified wood stove in winter and don't use air conditioning in summer. I use a clothesline instead of the dryer (mostly), and although I still use the electric stove, I do a lot of cooking on my wood cookstove in winter and solar oven in summer. In winter we get hot dish-washing water from the cookstove's water reservoir. Curious as to how we compared to everyone else, I found a national average at the U.S. Energy Information Administration for 2015. Their calculated average was 901 kWh per residential consumer per month. Of course there are a lot of variables to consider when comparing oneself to this: size of home and location, number of persons living there, and whether they use electricity only or also have natural gas or use home heating oil. Electric usage in the southern U.S. tends to be higher, because there tend to be more all-electric homes in the south. I can add from experience that it takes more electricity to heat a house in winter than to cool it in summer. Since I had priced an off-grid system when I did my first analysis, I decided to check pricing again. The cost of the systems is said to have dropped considerably, and since we're using less electricity, well, who knows? I'm being silly now, because we don't have the cash and I would never buy such a thing on credit. Still, I think we've done a good job on decreasing our usage and plan to continue to add solar options on a small scale. Every little bit helps. Last summer was a doozy in terms of too much heat and too little rain. If you're a regular reader, than you know we're working on additional measures to harvest more rainwater including a larger collection tank and garden swales. One day Geoff Lawton had a link in his newsletter to this page (second video down), and it got me thinking about double digging. Double digging is a biodynamic (French intensive) soil preparation technique. In permaculture terms this could be classified as "earthworks," i.e. the arranging of the earth to effectively capture and utilize water. What I'm actually creating are hugelkultur swales. Why not just make regular hugelkultur beds by building them on top of the ground? Let's answer that by starting with a look at the soil in my garden. that, but for some reason none of them were interested in posing in a ditch. organic matter present. The red in my subsoil is from iron. In the garden, my topsoil is typically about four to six inches in depth. Being mostly sand, it doesn't retain moisture very well. Water drains quickly and the soil dries out quickly. It has just enough silt and clay so that it dries rock-hard during drought-like conditions. When it rains, the topsoil quickly becomes saturated and water drains down to the clay subsoil. The clay absorbs some of the rainwater, but because my garden is on a gentle slope, the rest is drained down to the bottom of the garden. During prolonged periods of rain it's a big muddy puddle down there and it retains water for a long time. We discovered this by accident our first winter here. We wanted to plant an almond tree at the bottom of the garden and hit water while digging the hole. This wasn't a tree that liked having wet feet, so we planted it elsewhere. At the time I didn't understand what was going on, but after researching and observing, I see the patterns and the problems and want to take positive action to solve them. The flip side is that the top of the garden dries out very quickly. It seemed to me that double-dug beds would be a good way to harvest more rainwater to benefit the summer garden. Here's what I've been doing. It starts by hand digging a trench about two shovelfuls deep. The first shoveling removes the topsoil, which is set to the side. The second shoveling removes a layer of clay, which goes into a separate pile to be used elsewhere. Unlike my swale, which was filled only with logs, branches, bark, and corn cobs (no soil), this trench is filled with layers of rotted wood and bark, biomass, compost, and topsoil. I'm also adding dolomitic limestone and soft rock phosphorous because my soil is poor in those two minerals. Warm weather planting is upon us, so that's the next step. Now when it rains my double-dug bed should catch and retain some of the subsoil runoff. Will it work? Shortly after I took the photo at the top of this blog post it rained. One and a half inches later, my little trench had collected and was holding four inches of rain runoff. Of course, once the trench is filled in it won't hold this much, but between that trench and the organic matter I'm adding, this should do much to help my poor garden during dry spells. One last comment, this plan won't work in all types of soil. The particulars of my cecil soil generously facilitate it. Plus, in addition to rainwater catchment, double digging adds much needed organic matter to my soil in a way that should keep it productive for many years to come. Additional soil building and nutrients will be added as topdressed compost and mulch, where rain can deliver them to the roots as nature intended. No more hitting the clay and washing down the hill! Also, I have to admit for some renewed hope for root crops as well. Things like carrots and mangels were never able to penetrate that heavy clay subsoil and have been stunted for me. I'm counting more room for good root growth as another plus. Speaking of soil types, this might be the time to do a quick plug for my little eBook, How-To Home Soil Tests: 10 DIY tests for texture, pH, drainage, earthworms & more. Click the link or the book cover to learn what it contains and where to find it. These are the same tests I used to learn about my own soil! All of them are easy, inexpensive ways for learning more about your own soil, including tests and charts for everything listed in the subtitle, plus how to read your soil color and weeds. I've only just begun this project and don't anticipate having all my rows double dug before it's time to plant this year. It will be something I'll just keep working on for awhile to come.